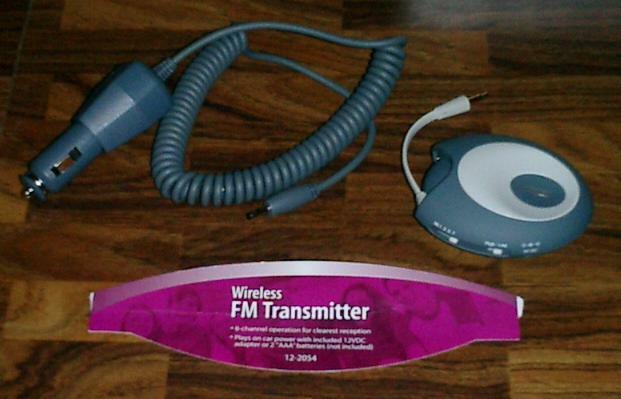 The RS 12-2054 transmitter is capable of being tuned to 8 frequencies: 88.1, 88.3, 88.5, 88.7, 107.1, 107.3, 107.5, 107.7 MHz. It will run on two AAA batteries or the supplied 12V to 5V car adapter. Inspired by this mod and this one I decide to hack the Radio Shack unit and document it for others. 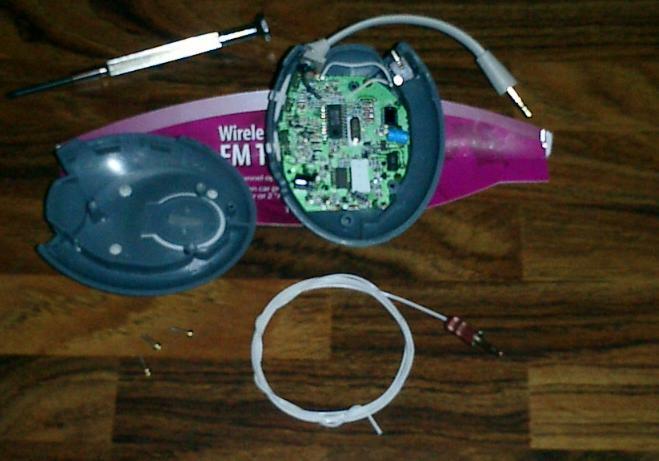 This is the contents of the kit as purchased from Radio Shack. This is the view of the back showing the three screws that must be removed once you unsnap the battery cover. This is the unit, opened and modified. I have glued a 3/32 phone jack (using Goop, the world's best glue) into the channel that is molded into the plastic body, originally designed as a place to "store" the audio cable end. The circuit board has four feed-thru's where the audio cable is soldered onto it, and they are labeled in silk screen on the hidden side as "L", "R", and "A", I presume for Left, Right, and Antenna. 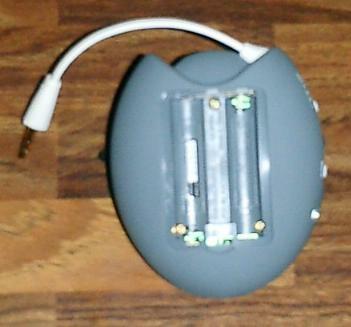 The 3/32 phone jack has a normally closed contact from the tip to another pin. The internal "antenna" is an extra conductor in the audio input cable. Desolder the black wire from the right most feed-thru on the circuit board (with the board oriented as in the picture) in the group of four connections from the audio cable. Extend the black wire enough to connect it to the "switched" pin on the 3/32 phone jack. Run a new wire from the "A" feed-thru to the "tip" pin on the 3/32 phone jack. The ground pin on the 3/32 phone jack is left unconnected. Now, if you don't plug anything into the 3/32 phone jack, the original "antenna" will still be used. It's awfully short at 5 inches, but it does work (some). If you solder a random length of wire to the tip connection of a 3/32 phone plug, and plug it in, then you will now be using the length of random wire as your antenna. If you want to be more precise, the "random" length is related to the frequency that you have the transmitter set to. This reference suggests that a good approximate half-wave antenna would be 57 inches long, and if you really want to be a weenie, you can further optimize the antenna to the exact length you need. In the cite above, the exact length of a half wave antenna at 88.5MHz is 63.5 inches. This is the unit with the external antenna plugged in and "deployed". Parts list. Radio Shack ("You have questions - we have blank stares") doesn't seem to carry a jack with a switched contact in it any longer, so I show the Mouser part. If you use an unswitched jack, you lose the ability to use the existing antenna if you unplug your big antenna, which problem may not be worth the hassle of ordering the switched jack.